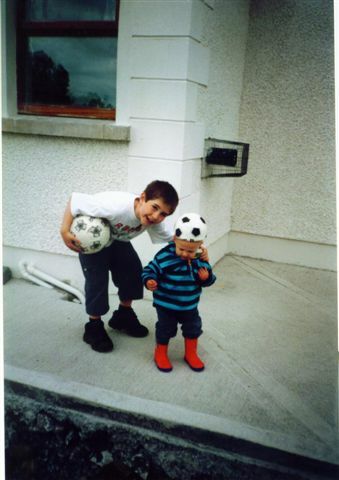 14/2/02 – It was a nice dry, sunny day, and Sean played outside with Andy a lot – I played some soccer and rugby with them. 15/2/02 – Sean cooked trout for himself. 17/2/02 – Pauline dropped Sean and me off at the nine-eyed bridge to do some fishing – we didn’t catch anything. We dropped Sean off at Martin’s on the way home. 18/2/02 – Sean and I did some guitar practice. 19/2/02 – Sean fed the [neighbour’s] lamb. 22/2/02 – Stuart & co. are back, so we no longer have to feed the lamb – Stuart gave Sean a large Toblerone in thanks. 24/2/02 – Sean was at Martin’s birthday party, and had a great time. 1/3/02 – Stuart took Sean fishing for an hour or two (no fish). 2/3/02 – Sean and I watched the Ireland–Scotland match, which Ireland won 43–22 without really being convincing – they seem to need some new forwards. Sean was delighted, of course. He and I did some kicking, passing and tacking in the field. 5/3/02 – I did some guitar practice with Sean, and Orla gave him and Pauline their lessons. 12/3/02 [Pauline and her friend put on a performance of Balor of the Evil Eye in Cavan County Museum, with a cast of 60 children …] Sean had an important part, as Lugh. 15/3/02 – Sean is very strong and solid, and both are very healthy. 22/3/02 – Sean and Susanna went to work at the farm for the first time this year. 26/3/02 – Sean is doing well at the guitar. 31/3/02 – Sean has been doing a lot of cycling with Robert and Martin, as well as wandering in the fields – an idyllic existence for a boy … We decided to go for a walk in Deerpark … We brought my bike and Susanna’s. Sean went off ahead, and almost immediately disappeared – there are numerous different routes through the forest. So the next couple of hours were spent with the other three of us looking for Sean – I separated from Susanna and Pauline for the last part. Of course he was back at the car. None of us had been particularly worried, but it was mildly disconcerting. Sean hadn’t been worried at all. 6/4/02 – Sean and I watched the eagerly awaited (by Sean) France–Ireland rugby match – a big win for France, unfortunately. 21/4/02 – Pauline and Sean practised the guitar. We watched Ray Mears’ Extreme Survival, which is a good programme – Sean especially likes it. 27/4/02 – Sean, Andy and I (and Pauline at times) watched Munster beat Castres 25–17 in the Heineken Cup semi-final – an epic Munster display. Hello Brendano. Happy photograph – and your son is holding one of the ubiquitous balls! It looks like the toddler’s bonnet has been designed to look like a football too. Once again, there is the sense of a happy, loving and creative family in the diary entries. You mentioned the forest episode elsewhere. Was the lamb the lamb of the photograph you posted? March 1st today. I hope that spring is in the air where you are. Hello Cymbeline. The toddler’s bonnet is actually a burst football! Actually, the previous photo with the lamb was of an earlier time than this (although the diary entries were later) – it was taken in the house we were renting while this one was built. So, the lamb was a later lamb too (and a pet) … I eventually mediated its sale to the owners of the first lamb. Spring is in the air and the sun was shining while we were out for a walk just now, but these are difficult days in various ways. If I remember rightly Séan found the burst football and put it on L’s head. L then refused to take it off all day!!! That is very funny about the burst football bonnet. What a funky little toddler!